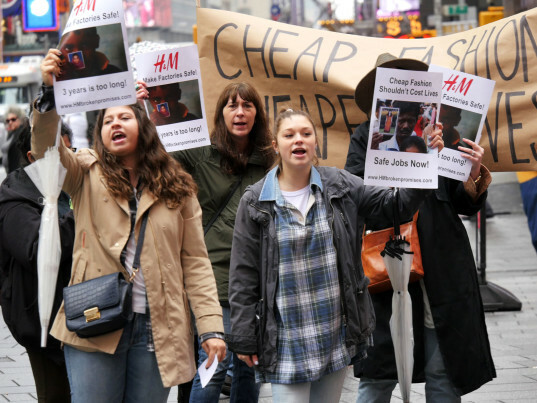 On the day of H&M’s annual shareholder meeting, activists from cities worldwide poured into the streets to demand that the Swedish retailer live up to its promise to keep Bangladesh garment workers safe. Three years after H&M led the signing of the Accord on Fire and Building Safety, forged in the aftermath of Rana Plaza’s deadly collapse, a new report claims that the majority of its supplier factories in Bangladesh are still death traps. Despite some modicum of progress, such as the removal of lockable doors and most collapsible gates, the Clean Clothes Campaign, International Labor Rights Forum, Maquila Solidarity Network, and Worker Rights Consortium say that almost all of the retailer’s factories remain behind schedule in carrying out mandated—and life-saving—renovations. According to a new analysis from the labor groups, 69 percent of H&M’s strategic suppliers have yet to complete the installation of all fire-rated doors, which would provide safe egress for workers in the factories. The numbers today, in fact, paint a bleaker picture than they did in January, since information from an additional 22 factories have now been made public. The new factories, the report said, performed comparably with the first 32 regarding fire doors but worse when it came to the removal of sliding doors, collapsible gates, and lockable doors. Liana Foxvog, director of organizing and communications at the International Labor Rights Forum, commended H&M for responding to earlier calls to safety by releasing a series of charts that enumerated its level of compliance with repairs and renovations under the accord. Still, despite noting in a prior communication that “fire exits are one of the most fundamental requirements for a supplier in order to be allowed to produce for H&M,” 61 percent of H&M’s factories, by its own admission, have yet to complete the required fire-door renovations. In light of the delays, the four labor groups want H&M to not only provide a “realistic timeline” for the completion of the renovations, but also disclose the financing it’s given its suppliers to facilitate repairs. 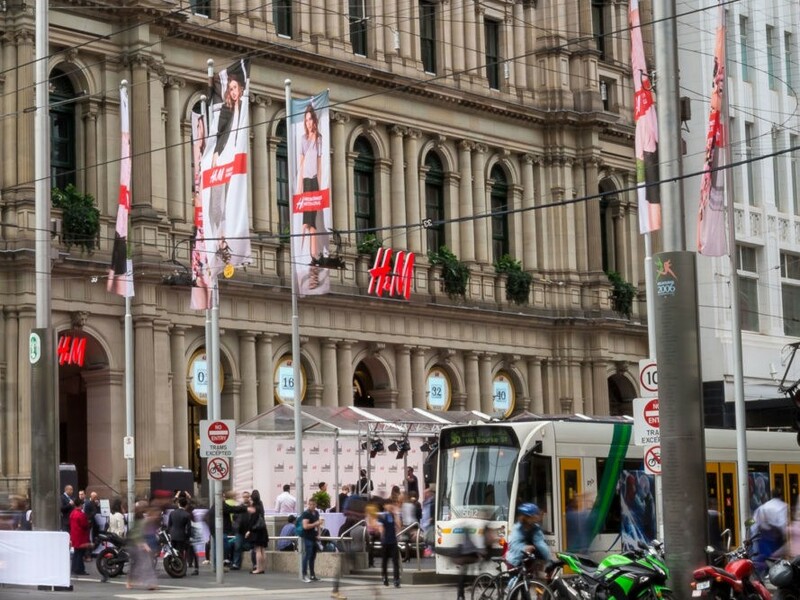 Others, like occasional Ecouterre contributor Amy DuFault, who led a protest outside H&M’s Time Square flagship store in New York City on Tuesday, take a dim view of H&M’s declarations of sustainability when lives remain at stake. On the day of H&M's annual shareholder meeting, activists from cities worldwide poured into the streets to demand that the Swedish retailer live up to its promise to keep Bangladesh garment workers safe. Three years after H&M led the signing of the Accord on Fire and Building Safety, forged in the aftermath of Rana Plaza's deadly collapse, a new report claims that the majority of its supplier factories in Bangladesh are still death traps. Despite some modicum of progress, such as the removal of lockable doors and most collapsible gates, the Clean Clothes Campaign, International Labor Rights Forum, Maquila Solidarity Network, and Worker Rights Consortium say that almost all of the retailer's factories remain behind schedule in carrying out mandated�and life-saving�renovations. According to a new analysis from the labor groups, 69 percent of H&M's strategic suppliers have yet to complete the installation of all fire-rated doors, which would provide safe egress for workers in the factories.